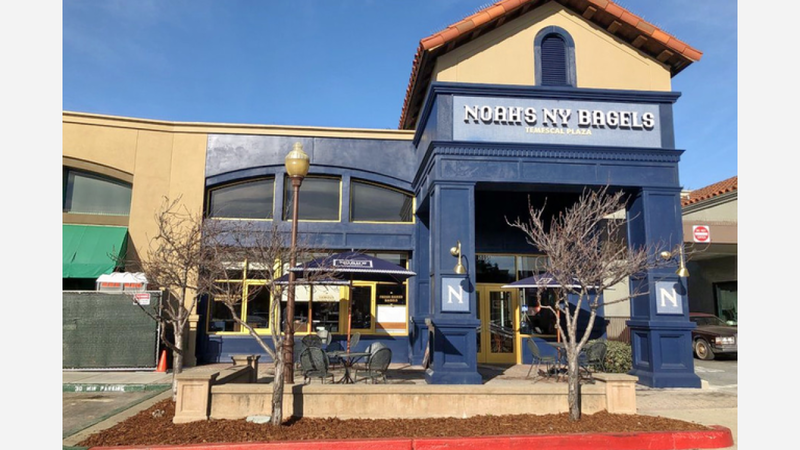 OAKLAND, Calif. -- A new Noah's Bagels has opened at the former Genova Delicatessen space at Temescal Plaza, which sat vacant for nearly a year. The addition marks the bagelry's third Oakland locale. The menu features more than 20 different bagel styles, like chocolate chip, blueberry, asiago cheese, whole wheat, and sourdough, along with a selection of its signature double-whipped shmears like garlic-and-herb and jalapeno-and-salsa. There's made-to-order egg breakfast sandwiches on offer, too, with options like turkey sausage, cheddar and bacon, and spinach. Lunch customers can expect sandwiches like pastrami on a potato roll, open-faced lox, and a veggie number with hummus and fresh veggies. Ted R., the first Yelper to review the new spot on February 4th, said he "showed up on Sunday, while the fixtures were still sparkling. First things first, the service was excellent. It was almost lunchtime, but I decide to start my Noah's experience with the core product, a bagel and cream cheese." Noah's Bagels (5095 Telegraph Ave. between 51st St. & 49th St.). is open weekdays from 5am-5pm, and on weekends from 5:30am-4pm.